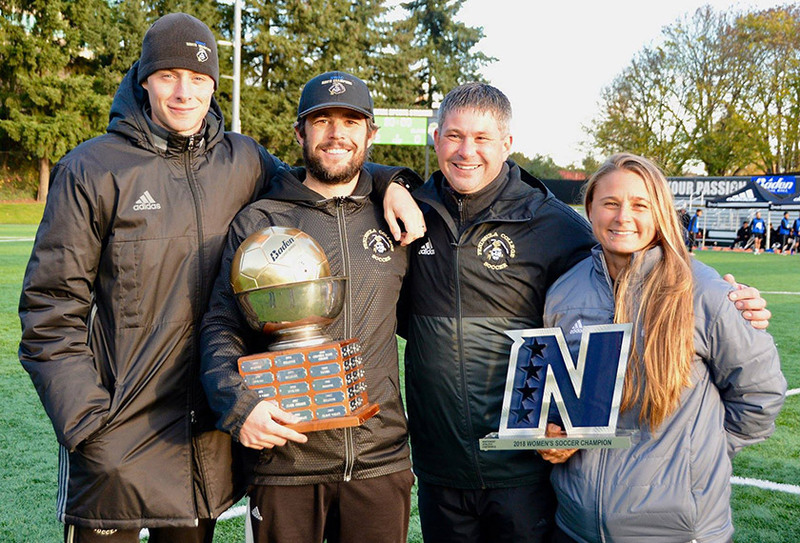 The winningest coach in the history of Northwest Athletic Conference women’s soccer, Kanyon Anderson, was named 2018 NWAC Coach of the Year last week. It is the third time Anderson, who last November won his fourth NWAC championship, was named NWAC Coach of the Year. He also won that award in 2011 and 2016. PC Soccer Coaches, Hughes, Anderson, Cooper and Shaffer. Photo credit Jay R. Cline. Anderson was hired to launch women’s soccer at Peninsula in 2010 and, since placing second in the league that year, he’s won it every year since. He went on to win NWAC titles in 2012, 2013, 2016 and 2018. “I am really happy to get coach of the year because it reflects on the mature approach the players took after losing the first two games on the year,” Anderson said. “It is also a reflection of the teamwork of the assistant coaches Jordyn Shaffer and Andrew Cooper. Jordyn, in her first year with us, helped create a kind, fun and strong culture. The players loved her and played so hard for her,” he said. The NWAC’s announcement of the women’s coach of the year, Anderson, and the men’s coach of the year, Jason Prenovost of Tacoma, is typically released in November, but was delayed this year.